One of the leading Australian beer companies, Victoria Bitter, is currently running a PWP promotion. 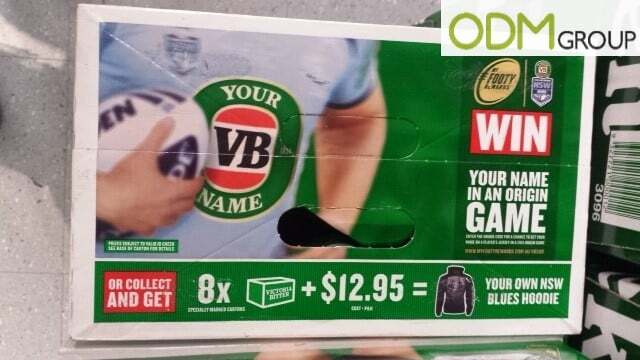 In this promotional campaign, consumers will receive a branded NSW Blues (Rugby team) hoodie. They can claim this prize after purchasing 8 specially marked cartons of Victoria Bitter beer, and paying AUD$12.95. What benefits will a PWP promotion for hoodies have? The first aspect to consider is the added incentive. By offering a sought after product, it becomes much more likely that consumers will be willing to pay for the 8 cartons of beer, along with the AUD$12.95 cost. Therefore this PWP promotion will help to drastically increase sales. Hoodies also make a fantastic promotional product, for a number of reasons. Firstly, hoodies can be almost completely customized, anywhere from the color, the logo, the size or the materials – which is especially beneficial if the campaign is being run on a budget. Hoodies also have a large area that can be used for printing your logo on. If you provide a stylish and high-quality hoodie, it’s very likely that it’ll be worn regularly in public. So when you combine the large branding area with the high public visibility, it’s a guaranteed method to boost brand awareness and exposure. Not only do PWP campaigns increase sales of the main product, but it also brings in profit from the promotional product itself. This is especially true with products such as hoodies that can be made inexpensively (by customizing which materials are used), but have a relatively high perceived value. If you’re interested in discussing this or any other promotional gift, then please contact us here. Our team will be more than happy to assist you with enquiries here. Alternatively you can contact our creative team, Mindsparkz, who would be glad to assist you with the design of any promotional product.